Behavioural nudges are everywhere: calorie counts on menus, automated text reminders to encourage medication adherence, a reminder bell when a driver’s seatbelt isn’t fastened. Designed to help people make better health choices, these reminders have become so commonplace that they often go unnoticed. In Nudging Health, forty-five experts in behavioural science and health policy from across academia, government, and private industry come together to explore whether and how these tools are effective in improving health outcomes. Behavioural science has swept the fields of economics and law through the study of nudges, cognitive biases, and decisional heuristics?but it has only recently begun to impact the conversation on health care. 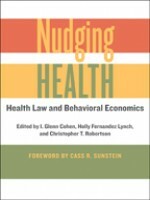 Nudging Health wrestles with some of the thorny philosophical issues, legal limits, and conceptual questions raised by behavioural science as applied to health law and policy. The volume frames the fundamental issues surrounding health nudges by addressing ethical questions. Does cost-sharing for health expenditures cause patients to make poor decisions? Is it right to make it difficult for people to opt out of having their organs harvested for donation when they die? Are behavioural nudges paternalistic? The contributors examine specific applications of behavioural science, including efforts to address health care costs, improve vaccination rates, and encourage better decision-making by physicians. They wrestle with questions regarding the doctor-patient relationship and defaults in healthcare while engaging with larger, timely questions of healthcare reform. Nudging Health is the first multi-voiced assessment of behavioural economics and health law to span such a wide array of issues?from the Affordable Care Act to prescription drugs.